The "legend" of the DeMolay ritual is that it is virtually still the same as it was when written by Frank Marshall in 1919. But, how true is that statement? This is a public website, so we can't do an in depth analysis of our private ceremonies to answer that question here, but we CAN take one piece of the ritual that has been authorized for public performance and see how THAT has changed over the years. Thanks to "Dad" Gregory M. Schaeffer, Executive Officer of Pennsylvania, and long-time member of the D. I. Ritual and Regalia Committee, we have an in-depth analysis of the "Nine o'Clock Interpolation" reviewing the text from every edition. 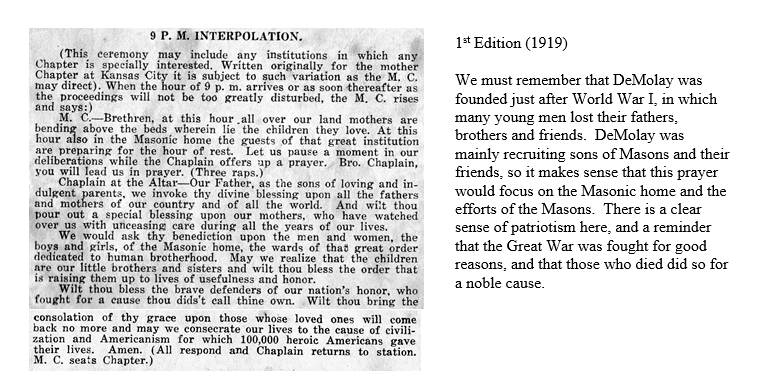 Posted below is the text from pertinent sections of the 1st through the 15th (current) Edition. As you read through each version you will see how the text changed, and will understand why. 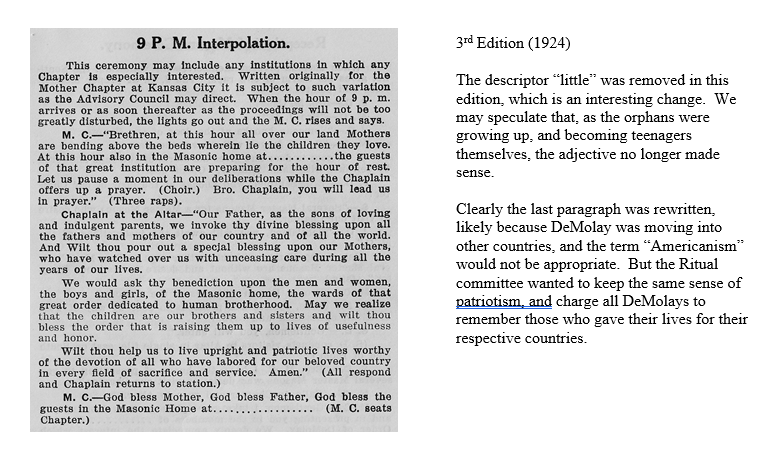 By 1924's 3rd Edition, DeMolay had spread to Canada, and the Americanism of the last paragraph was inappropriate, so it was made more generic to work for ALL countries. 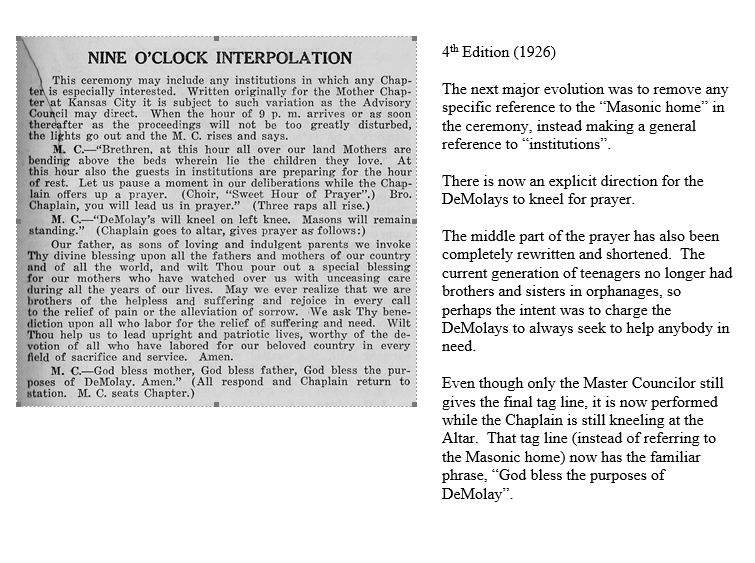 The 4th edition of 1926 further refines the instructions to require all active DeMolays to kneel for the prayer. The reference to orphans is made more inclusive of others who also need our prayers. 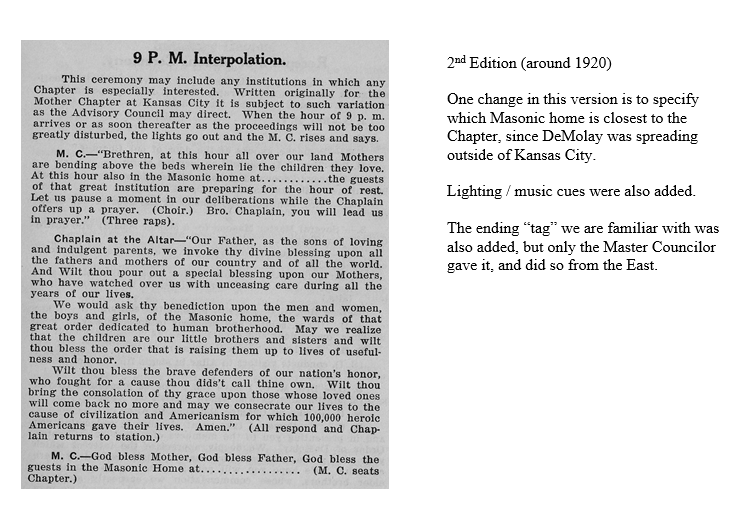 The 9th Edition of 1963 adds the use of the Chapter gong to initiate the beginning of the ceremony. 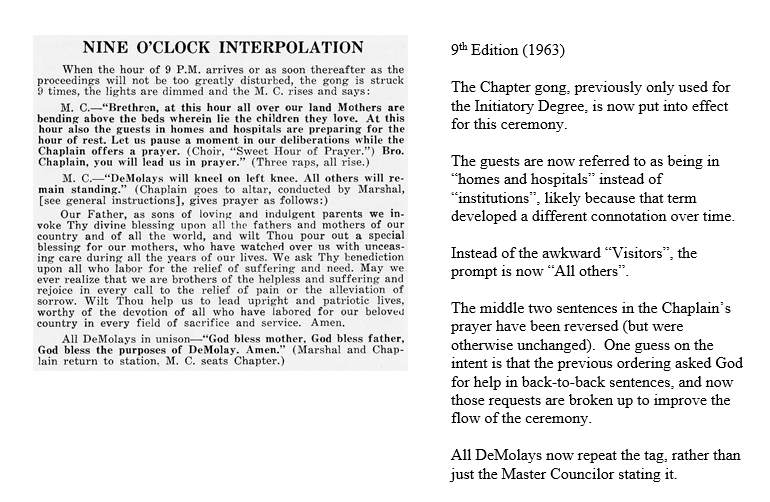 Two sentences were reversed, and all DeMolays are instructed to say the final group blessing at the end of the prayer. Also, "the guests in homes and hospitals" replaced a reference to "Institutions," a word which had developed a negative connotation. 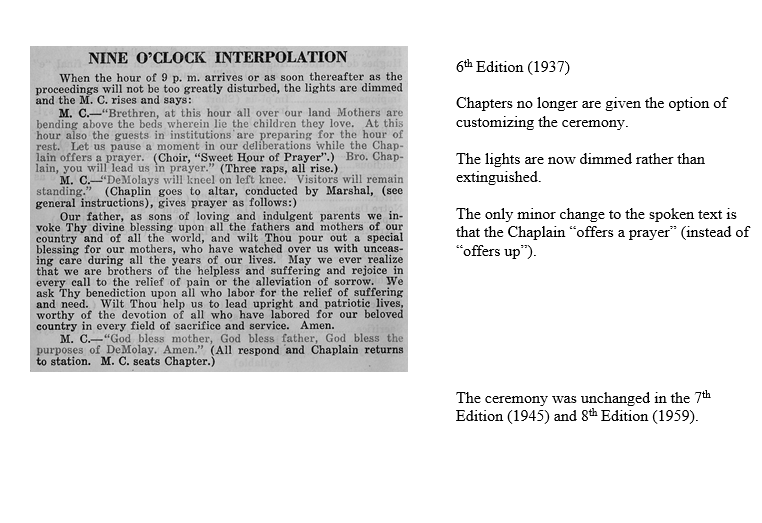 The 10th edition of 1964 shows no text change at all, except for authorization to perform it in public, and this is the same text as published in the 1965 1st Edition of the Monitor of Public Ceremonies. 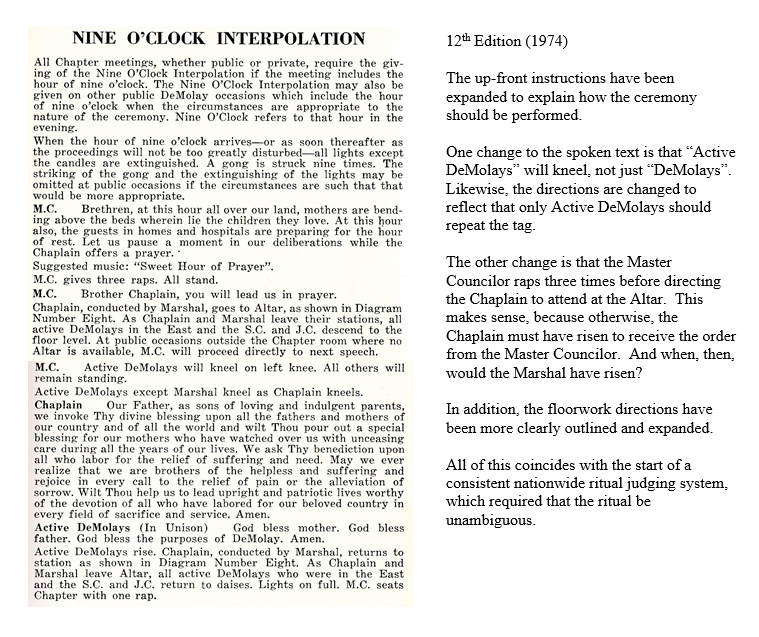 The 11th Edition of 1969 added the requirement that the 9 O'clock Interpolation be done at EVERY meeting of the Chapter. The 12th Edition of 1974 gets very specific with floorwork instructions and gavel raps. This makes sense as it coincides with the development of the dominant tournament ritual judging system, where both words and precision matter. The first version of the A-Z floorwork instructions debuted in this edition. 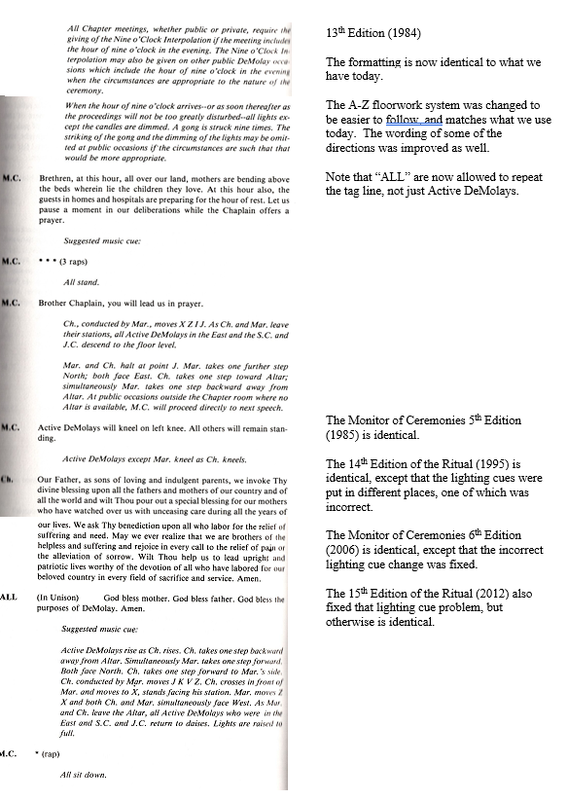 The 13th Edition of 1984 created the format that we see in the Ritual today. 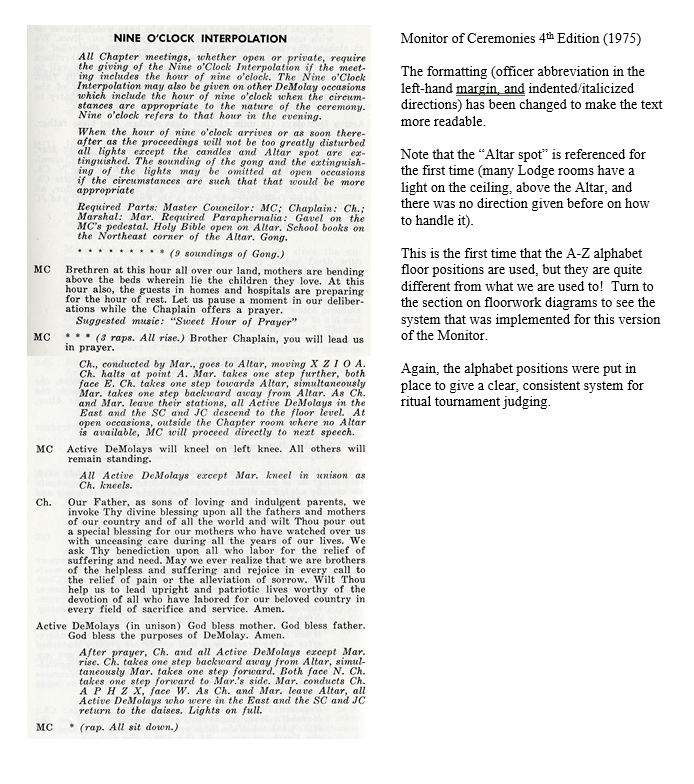 The A-Z floorwork instructions were revised to create the system we have today. This is also the first edition that identifies ALL present should say the closing blessing line. The 14th Edition of 1995 specifies more lighting cues, but everything else is the same as 1984. The 15th and current Edition only fixed a bad lighting cue. So, now you can be the judge whether or not the ritual has changed since it was first performed. 1.) Why do you think the text changed so much in the first 6 editions and then has had only minimal word changes in the next 9 editions? 2.) 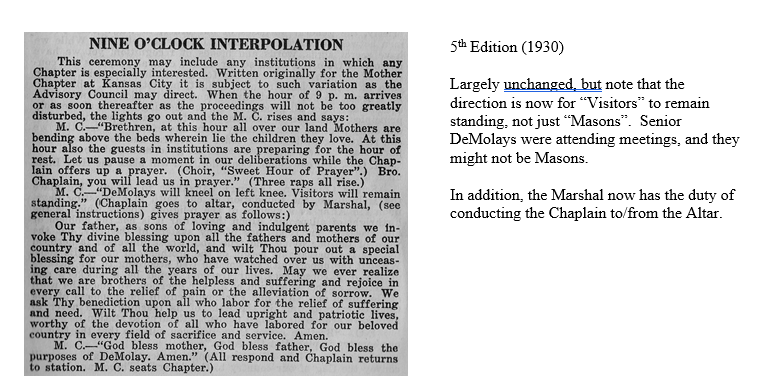 Early in the history of DeMolay, Ritual changes were enacted by “Dad” Land and “Dad” Marshall, who were not afraid to make adjustments, and then quickly change them back. Do you know how changes in the Ritual are made today? 3.) Ritual Tournament judging made it very important that set-up instructions and floorwork be very specific. Have you ever participated in a Ritual Competition? Were you prepared to participate, or did you get surprised by how thorough the judges are at doing their job?